Could one of you fine folk, point me into the right direction here? I am trying to figure out how to give AI's access to their other Mystic Artes but I dont know one thing. If I use the artes editor and tick all artes option, I can see in the skill assign menu all possible artes in the game. However when I choose Character data and pick a character, I see only a dummy arte, something called char data base set to 100. Can someone explain how this works? I am using the table Geo made. when I choose Character data and pick a character, I see only a dummy arte, something called char data base set to 100. Can someone explain how this works? So the artes section in my table isn't complete. I put a dummy arte just to have one there and anyone willing to help out can just add more to it. You can test each bit and each address for a specific arte your looking for, but just so you know, it isn't completed. Also the "char data base" is just the beginning of the section of data for the character you chose initially. Why the value for "char data base" address is 100, i don't know. Never looked into it. My PC is dead right now (super cluck my CPU and it get fried with the motherboard). I am use my phone. I need 3 more day for Amazon shipment to reach me . So tell me what is the problem if the poblem is that character point states is not change you go to states window that show the character tital and it will change or you can use the non change pointer address ( I will repost it). If it is the tital that is not working then tell me and I will recheck number. I have already updated my art and inventory. I also made enemies character change point states you need to press the L1 or equalvrance of it to see what enemies states. Try my tablet. it is working for me but will not unlocked permeantly any art that the use should not have. Or use 02 character - art - (character name). I appreciate the thought, but from what I can see, You can only change uses of arts with your table, not unlock them in any way. It can so far edit items, what skills they give, resistances etc. I coouldn't find any community that cared about PC DE modifying oher than this one and the PS3 save hacking guides / ips patches so excuse me for plugging this here. If there is a useful forum where this might belong that'd be great. If it's illegal here and this post should be removed I understand, still, I worked hard on it during work time and it proved useful to me and hopefully someone may find it useful too. That's pretty cool. Would've been more convenient if it was written as an executable, but other users probably wont care. I think the best thing about this is people can see the code on how the file was parsed and find that file in memory when the game is loaded. 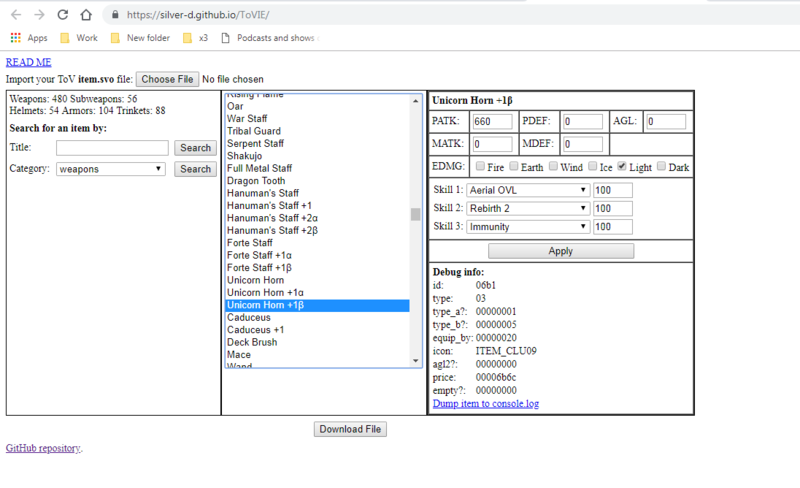 They can then check what accesses the item properties and make scripts to affect them or find things correlating with them. That is if anyone plans to do anything like that. Oh it would make me super happy if anyone found a use for the address map i painstakingly tried to wrap my head around. There is a lot more to be discovered in every item's entry, too. I really hope someone manages to port over the enemy HP multiplier from the Tales of Berseria table. Now that RE2 is finished for now I can get back to playing this game. I probably missed this in one of the tables, but is there a way to unlock specific Artes for a character? good , i know that probably could be a mess , but you think you could consider some day to create a script that allow to use the bosses ? not only their model of course , i mean the bosses with all of their animations and techniques , also what make so hard to create that kind of mod ? 1-incload Equip Equipment and Equip Art for character. 3-re instated character states but you can only unlock skill and title for that character, For other character use change pointer (character on screen). 4- update Inventory to incload all Item , all Equipment , and all DLC. key item and attachment is incomplete. 1- numbering Inventory like in the game. 3-change the Equip Equipment and Equip Art to drop down list.